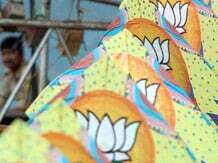 The government has remembered the food security bill just as elections have neared, the BJP said Tuesday while stressing that it was opposed to an ordinance and wanted an early monsoon session to debate the issue. Amid speculation that the government had prepared a draft ordinance on the food security bill, BJP vice president Mukhtar Abbas Naqvi said the government had itself delayed the passing of the bill and wanted to avoid a discussion. "The government could have got the bill passed when it was pushing FDI (foreign direct investment) in retail. For the past nine years, the government has been working for corruption security. Now when the elections have come near, it has remembered the food security bill," Naqvi told the news agency. "They must hold the monsoon session early to pass the bill," he said. The move to bring an ordinance on the issue would mean that the government wants to avoid the debate and go for early polls. "We want a healthy discussion; why is the government running away from discussion? There is no consensus in the UPA on the bill," Naqvi said. His comments come a day after BJP president Rajnath Singh expressed concern over the United Progressive Alliance's (UPA) plan to issue ordinances to enact legislations. He said the monsoon session of parliament should be advanced in order to debate and pass the food security and land acquisition bills with some amendments. After the UPA coordination committee meeting Monday, Parliamentary Affairs Minister Kamal Nath said the food security bill was not discussed and all options on how to move forward were open.